We do have new bracelets coming to Throne of the Dread Terror in 19.2 that will provide Will, Agility, and Might. We appreciate folks' interest in both our end game non-raid and end game raid loot. Realease notes are out and they're interesting. Like the sound of 20% morale heal from Blood Arrow with a 15 second cool down. Could potentially be an issue in PvP but certainly is now comparable to the RK's self-heal. I didn't have the chance to check the other essences' stats, except for will. The recipes are automatically granted upon login. "Each crafting profession will get a new, rare ingredient that can be found in The Throne of the Dread Terror, North Ithilien Flora, Featured Instances, and the Yule Festival. These crafting items are tradeable. Crafters will use these ingredients to make a Wild Essence barter item, which is also tradeable." You need the bundle of ithilien treated wood rare ingredient (for woodworker, other proffessions ingredients have different names). The droprate from flowers seemed bad, though i didnt farm many (~0/30). I did a featured on 105 and 3/5 members got 1 from the box. On lvl 100, noone got one, even though we were only 3. Perhaps it makes sense that only 105 drops them. 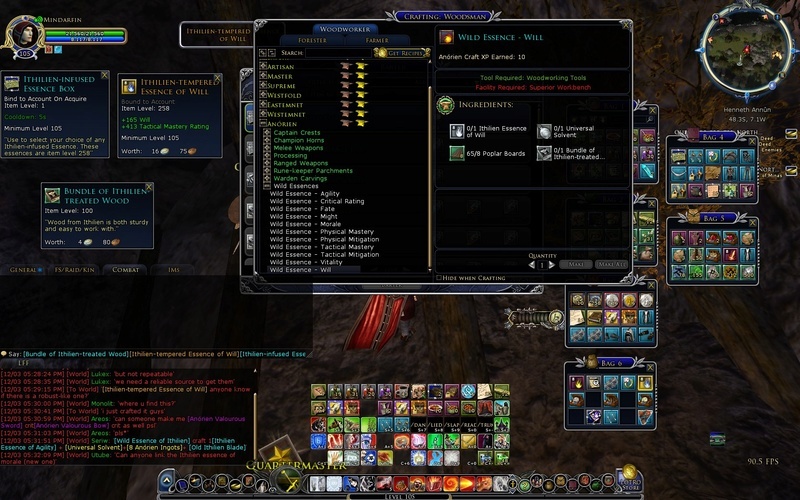 You trade the wild essence of ithilien for an infused ithilien essence box. Upon opening it, you see the whole list of essences but !without stats! (that's the reason i could'nt check the rest of the essences stats). You choose one and it goes into your inventory as "bound to account". I believe that at least for the other main stat essences, the stats are very similar. No idea if robust equivalents exist. I'm reading on the official forums that the golden output which i showed in the picture was just lucky and most of the times it's going to be teal, which is worse than the current supremes probably. Perhaps it's not worth the grind at all. Guys I am very disappointed with the release notes, not to say furious. I am the old kind of player who prefers to get into group and work with them to beat challenging content that will get special rewards. For me this is a way to promote grouping, socializing, skills, good behaviors (co-operation, discussions) e.t.c. I understand that there are also other kind of players as well, i.e. soloers, but I am not one of them. As such I am not in picking flowers and in doing solo dailies or t1 boring staff over and over and over again to get the essences. Also new gear will make content easier. As such I will stay back a bit from flowering /daily grinding and will only join for the raids (my gear is more than enough to go there). Hopefully not all will lose motivation to go there (as now one who is picking flowers can have a far better gear that the one doing raids, except dps classes for the bonus of the armour) and we will keep on going. Same happened to me with update 17 as well (we became semi gods and lost interest). Will probably go full active again in update 20 when those essences will be again obsolete and we will go for new but hopefully this time through group content. I don't understand this stuff. That solo players get better gear than us. As we discussed many times in ts, in my opinion they don't need such good gear for just picking flowers. As koukou said, I also understand that people need gear but what I don't get, why better gear, stats wise, than raiders. Good you spend eventually quiet some te to collect flowers. But it is not important. Lethe raid cost any of us quiet some time, disappointments etc etc. So I can understand everybody disappointments. Also I hope we keep going, doing the raid and people don't stop coming for it. Would be a shame if we would stop now, since we are getting close to getting the 4th boss down.